The Red Cross has announced that there is a desperate need for blood donors this time. Mark your calendars to be a blood donor on Thursday, July 19 from 1-7pm at the Knights of Columbus Hall on Willow Street in Westborough. 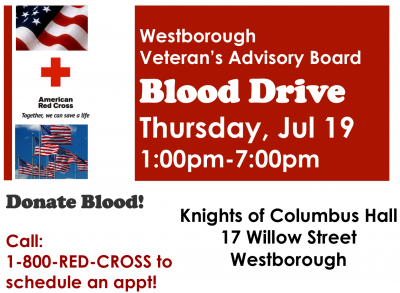 This blood drive is sponsored by the WESTBOROUGH VETERANS ADVISORY BOARD. Thank you for your support.